Find shoes, booties, heels and slip on sneakers for women. Shop for famous footwear online or in a store near you for your next pair of fabulous shoes. No need to wait for a shoe sale: find designer brands at amazing prices every day. 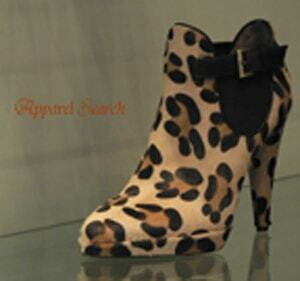 Search for new exclusive designer shoes, heels, wedges, sandals, boots and more. Save on all the brand-name shoe styles you adore. Shop the most trendy collection of women's shoes online or in stores. You just need to spend a little time searching the retailers on this page to find the right footwear collection to satisfy your desires. Learn more about Women's Fashion and footwear. Also, check our shoe stores directory page. Activa: Activa offers fitness gear for active, powerful women. On their shopping web site you will find Women's Fitness Apparel: active wear, casual clothing, yoga wear, sportswear, bra tops, tanks, sports bras, pants, tights, shorts. Women's Active Footwear: running shoes, walking shoes, aerobics shoes, sneakers and casual shoes. Women's Workout Gear: accessories, fitness watches, heart rate monitors equipment and more. No matter what your activity Yoga, Running, Walking, Hiking, Working Out, Weight Training, Biking, Aerobics or Pilates Activa's got what you need to help you stay fit and healthy. Adidas: they strive to be the global leader in the sporting goods industry with sports brands built on a passion for competition and a sporting lifestyle. Their strategy is simple: continuously strengthen their brands and products to improve their competitive position and financial performance. Alden Trading women's shoes such as moccassins. Aldo Shoes a privately held company, which operates over 600 retail, stores across Canada, the United States and United Kingdom. ALDO specializes in the creation of high quality fashion footwear, leather goods and accessories. This sought-after brand pays close attention to detail and fine craftsmanship. ALDO is dedicated to bring you both quality and cutting-edge trends at affordable prices, season after season. What's more, ALDO's dedicated team of buyers and stylists constantly travel the globe to keep you on the pulse of fashion. Whether the latest footwear trends are breaking in London, Milan, Paris, New York or Tokyo, ALDO will have them on your feet first! Auditions: offers you more than 700 styles from quality name brands such as Soft Walk, Easy Spirit, New Balance, Ros Hommerson and Trotters. They Have Your Size Auditions offers a full range of sizes (4 to 14) and widths (AAAAA to EEEE). And there are no extra charges for extended sizes. B.A. Mason's: B.A. Mason is a family-owned company located in Chippewa Falls, Wisconsin. They are proud to announce the year 2004 marked their 100th Anniversary of providing fine quality footwear to men and women throughout this great land of ours. Bells Shoes (United Kingdom) is the home of premium quality, branded footwear, offering a full range of shoes, boots and sandals, along with accessories such as bags, scarves and hats. Established in 1890 by Edward Bell, today Bells Shoes is owned by the Martin family who run the successful online business alongside their Buxton town-centre shop. Brighton: The Brighton brand was launched in 1991 with a single collection of belts. But over the years, Brighton has become an accessories company with something for everyone. Handbags were added to the line in 1993, followed by small leather goods, watches, footwear, fragrance, jewelry, home accessories and eyewear. The collection also includes men's belts, wallets, watches and other leather accessories. Candies: Candie's, Inc. is in the business of licensing the Candie's and Bongo name on a variety of young women's footwear, apparel and fashion products, and is a leading designer, distributor and marketer of jeans wear under the Bongo brand through its wholly owned subsidiary, Unzipped Apparel, LLC. Candie's also arranges for the manufacture of footwear products for mass market and discount retailers under the private label brand of the retailer. The Company operates 21 Candie's retail stores across the United States. Cinderella of Boston: For over 50 years we have been the leader in women's petite fashion footwear. Sizes range from 1 to 5 Narrow, Medium or Wide and are specially crafted for a woman's foot. Regardless of your age or lifestyle, you will find styles to fit your fashion needs. Casual to sophisticated, low heel to high heel, Cinderella of Boston has a shoe to satisfy all your petite footwear needs. Cole-Haan: Cole Haan footwear and accessories celebrate the art of fine craftsmanship through timeless design. They began in Chicago in 1928. Their name comes from Trafton Cole, who created Cole Haan's reputation for quality and incredible craftsmanship, and Eddie Haan, the man who made it all about service and style. Originally Cole Haan was a men's footwear label and it typified the spirit of the '20s, when style was everything and quality was assumed. Footwear was beautifully designed and very well made. Cole Haan's high-quality contemporary classics are manufactured by leading artisans globally and marketed in the finest retail stores in the world. A wholly-owned subsidiary of Nike, Inc., Cole Haan has its international headquarters in Yarmouth, Maine and its design headquarters in New York City. Converse: sports shoes. Learn more about Converse. Have you seen the Apparel Search Shoe Shopping section.